Day 2: Grizz, Snow, Choss, and Goats, OH My!!! Brendan and I woke to the sound of rain hitting the tent. The rain started the night before as soon as we zipped the tent closed. Unfortunately there was no sign of it giving up. 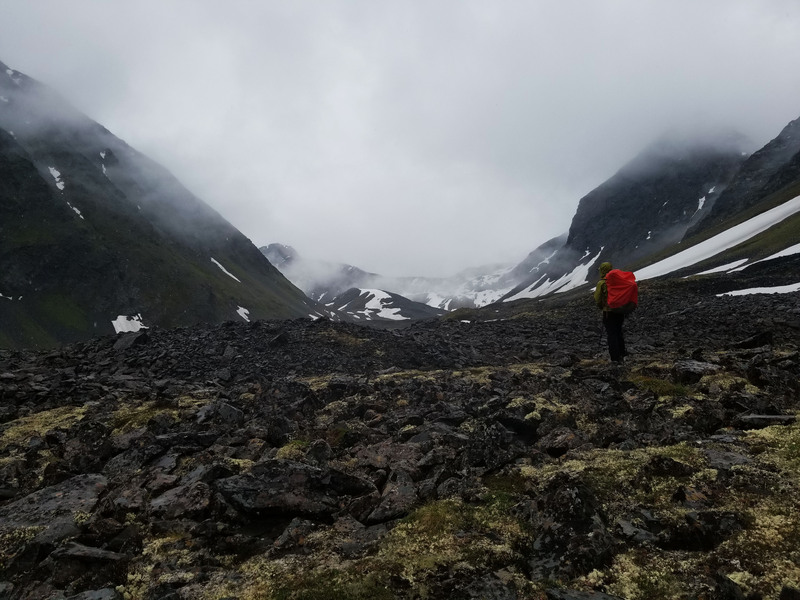 We poked our heads outside to see a low looming cloud near the surrounding peaks and a grayed out sky slowly drizzling down its rain on us. Gah, I didn’t want to move, I had slept so well that I didn’t move an inch all night. 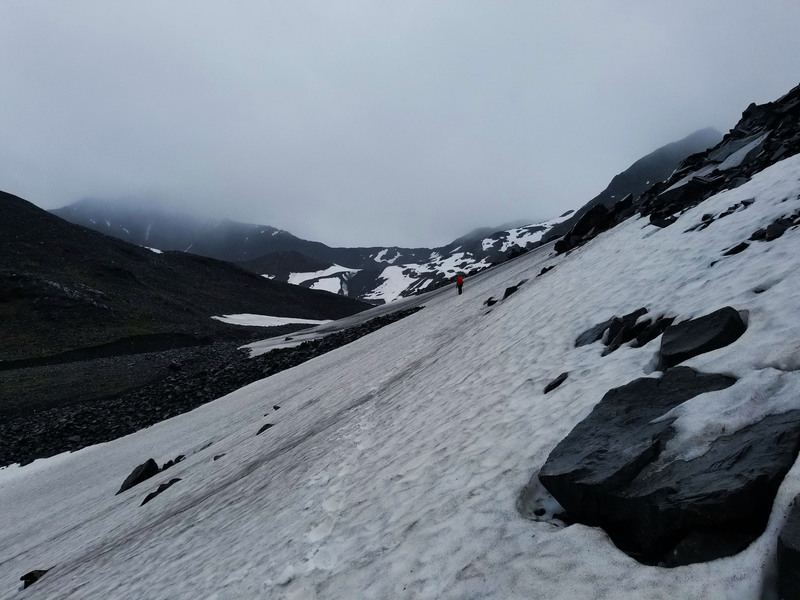 Regardless we had no choice but to get moving, trying to find our way out of the Chugach. Welp, time to get moving! We packed up camp, pulled on our rain gear, and soon stood ready to let out from the no name lake we found the night before. I bought Frog Togs on the way to the trail head as I neglected to bring my rain pants with me . . . . . they ripped in the first 2 minutes, right up the crotch . . . hahaha! I could tell it was going to be a good day! 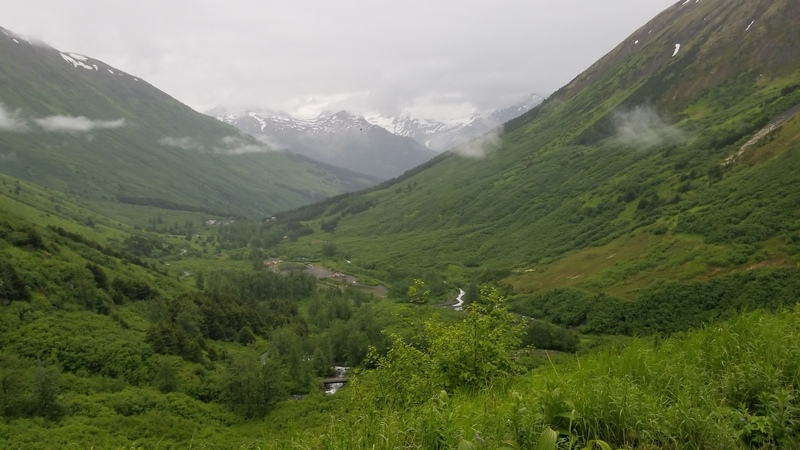 The rain drizzled on as we began to skirt north, across the wide open side draws that fed the North Fork of Ship Creek valley. 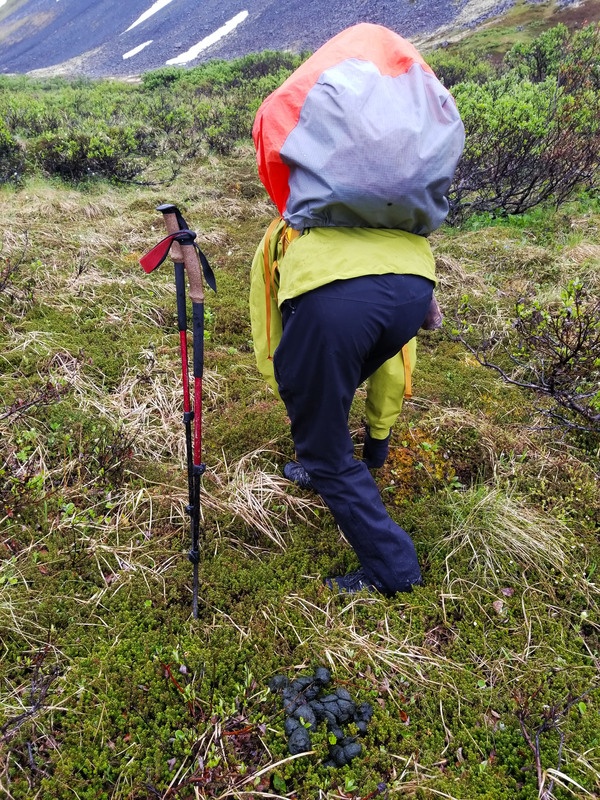 The ground was covered in a cushy nice moss and speckled with jetting rocks here and there. We gained a small ridge and we could see the whole valley including the contributing side canyon that we oringinally intended to use to approach Organ Mountain and Synthesizer Peak. 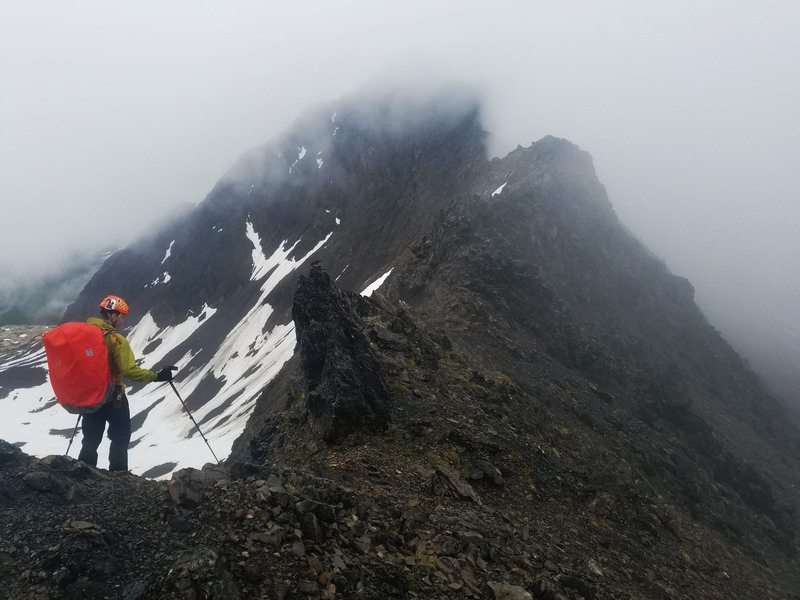 All we could do was speculate from a far, as the weather, snow in the shoot, and whiteout conditions made us call for a “raincheck” on the peak attempt. With bluebird dreams in our heads we dropped into the next valley, crossing a stream were the open draw headed up canyon via Ship Creek towards Moraine Pass. We saw a nice big pile of fresh bear skat in this valley, we kept our heads on a swivel in this grizz filled country. 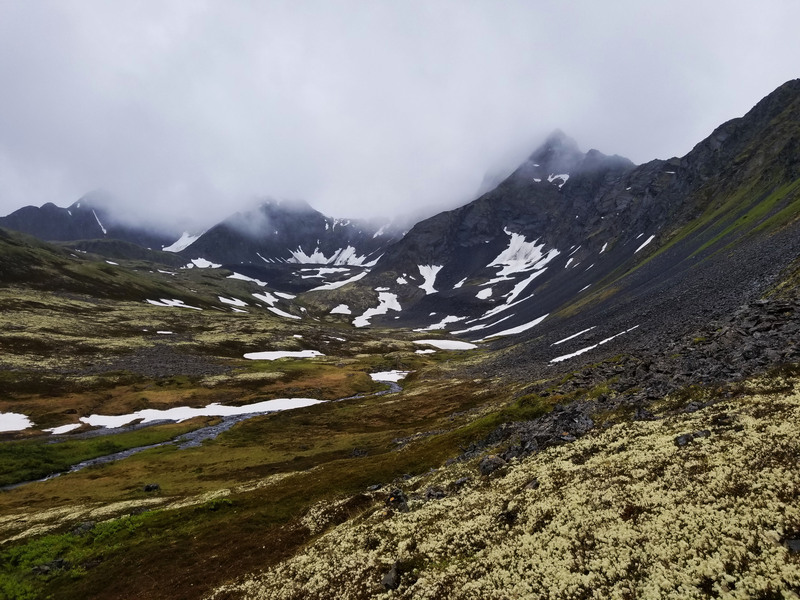 No one wants to accidentally come face to face with a bear, especially way out here in the heart of the Chugach. We kept skirting the south side of the valley headed east, and soon Grizzly Bear Lake came into view. Choss and snow be darned, up we go! Even with the clouds looming and the rain drizzling it was still gorgeous out here. Gnarly looking raw peaks jetted up on either side of the valley loomed in clouds with lush green bases, touting huge vertical gains, just daring to be summited. We stopped for a nice snack break. Grubbing down on PBJs and chips we looked in the distance to the snow covered Paradise Pass that we had to gain for our exit. 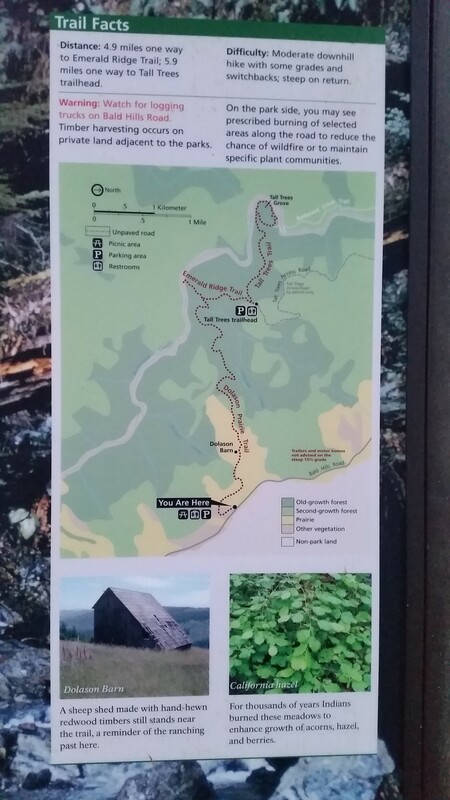 We planned to dump down into Paradise Valley which would connect us back into the trail to Crows Pass. Brendan pointed “When you see this thing up close you are going to be like “why the heck did they name it paradise pass?!””. We chuckled at we snacked on taking in the incredible views. Still a long way off to go, we pressed up a steep snow covered hill to enter the open Moraine Pass. Brendan took off up the snow like a Polar Bear, walking straight up and soon kicking in steps as the incline became almost vertical. I followed suite, and after a nice steep push we could see the next obstacle. Snow patch after snow patch, we hopped between the good snow and rocks avoiding the rotten snow pack. When you stepped on it, it would just give way, letting you sink like a brick. 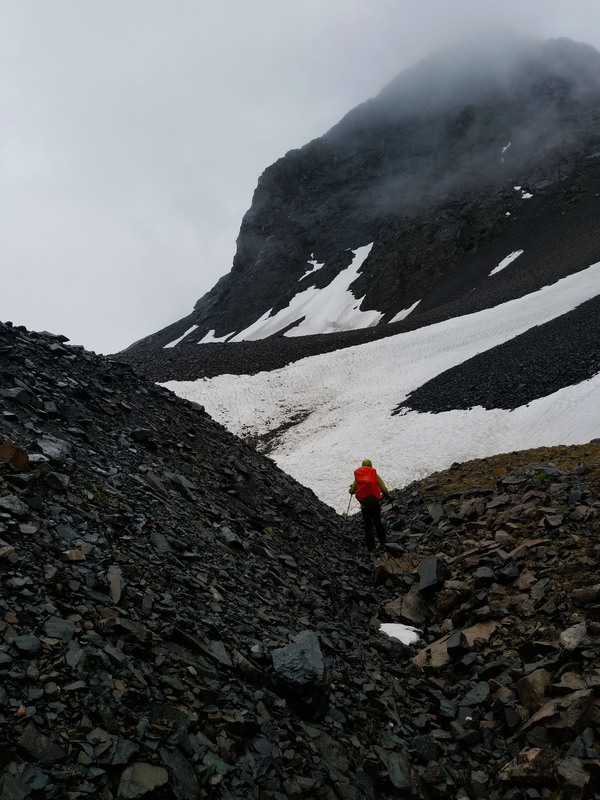 A snow patch just below Paradise Pass was particularly rotten, so we decided to use a snow ramp to climber’s right to gain a rock traverse that would eventually bring us to the thin knife-edge pass. We kicked in snow steps once again. High on the ramp I looked down as the snow started to rot out just before reaching the rocks. This is the last place I wanted to fall I though to myself . . . one careful step after the next I finally grabbed chossey crumbly crap rock on the other side, whew!! Relatively safe?! 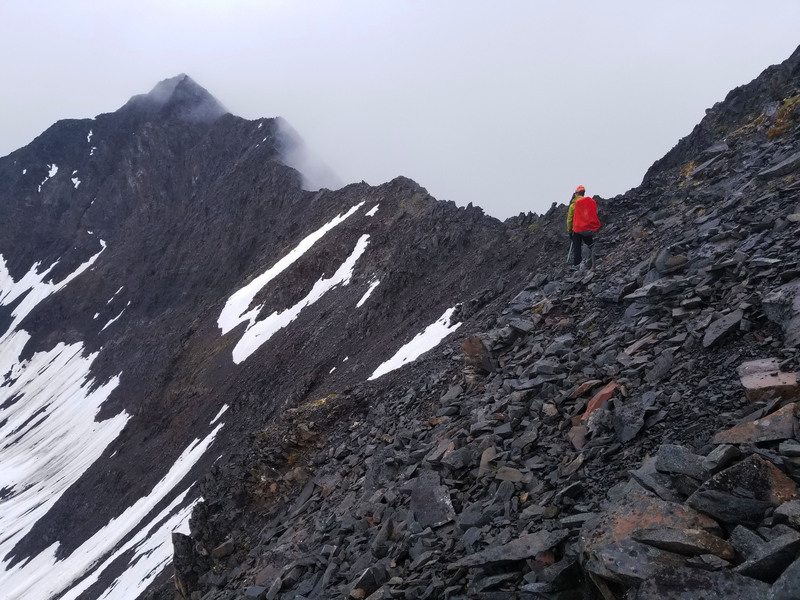 We skirted the chossfest rock face until just before the pass when the great Chugach gave us one last nice class 4 step across crumbly rock. Not one hold was good, and the price of a mistake here would send you a few hundred feet below. You probably wouldn’t die . . . but it would definitely hurt. Everything was coming apart like trying to rock climb a sandcastle . . . with a nice big pack on. Brendan moved past it and was chilling on the pass I went for the move. Not one good hold, I just tried to distribute my weight out to 3 points as I moved. I stepped across as lightly as I could . . . and to my relief, soon standing on the knife-edge Paradise Pass with Brendan. Gotta love the spice level . . . Spice Word! The rain stopped and the clouds rose just momentarily enough for us to cook some lunch and take in the sights. Its Paradise Boys! Count Chossula has definitely been here! This looks like a good place for some Maruchan Chicken! We packed up once again and got going. 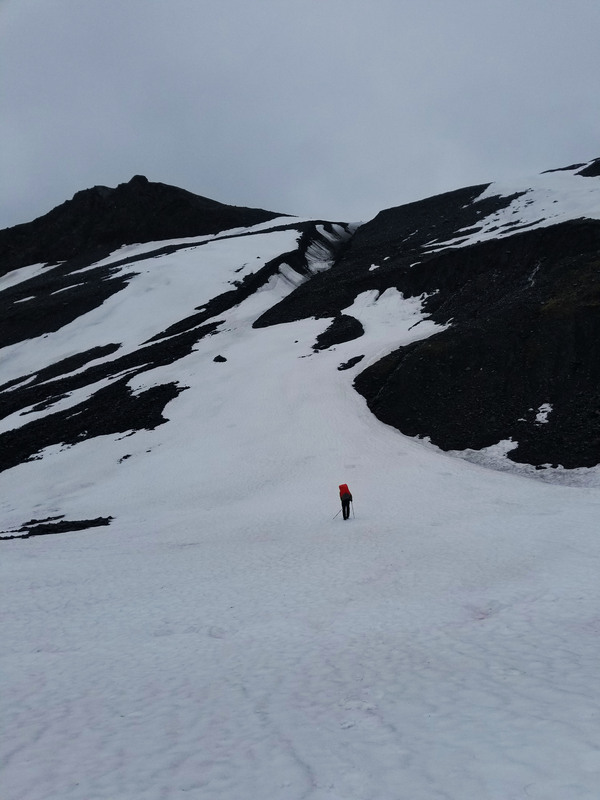 We dove the scree field into Paradise pass, pushing quickly, surfing rocks and snow when there were good patches. We soon found ourselves at the mouth of Paradise Pass side hilling on a small goats path towards Clear Creek valley. We dumped down into Clear Creek valley and searched for a good crossing, I went high and Brendan went low. Soon, after some careful navigation and wet feet, we were on the other side of the creek. 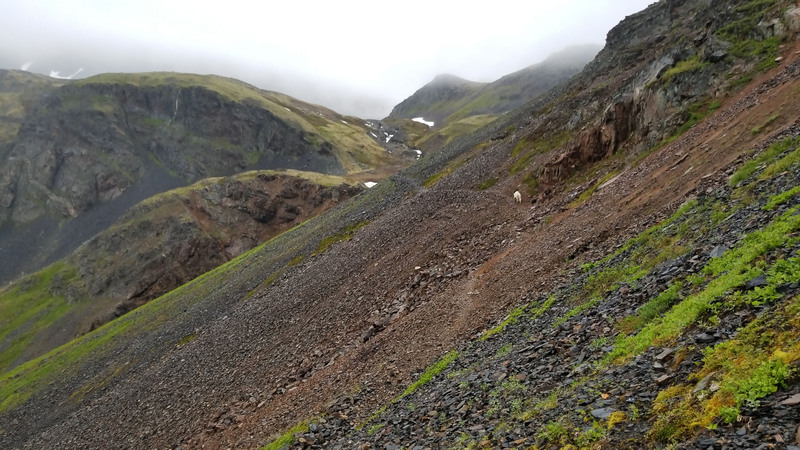 We pressed on, finishing out the side hilling and tied back into the trail to Crow Pass. 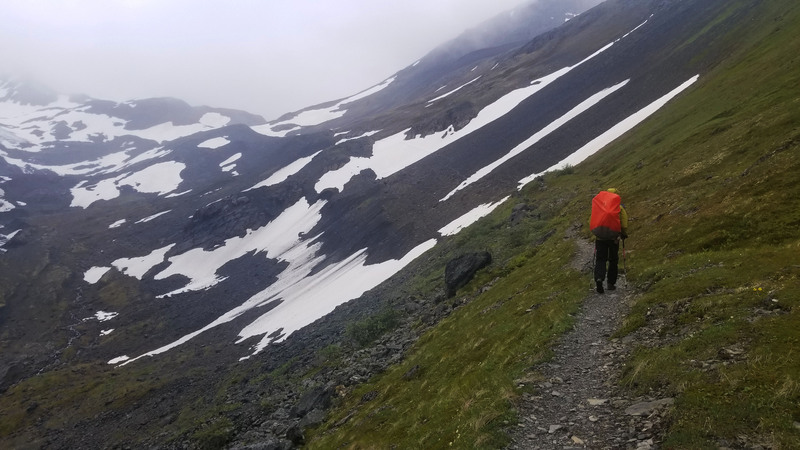 We gained Crow Pass, meeting a few day hikers and backpackers for the weekend. The rain kept coming down and the clouds closed us back up. 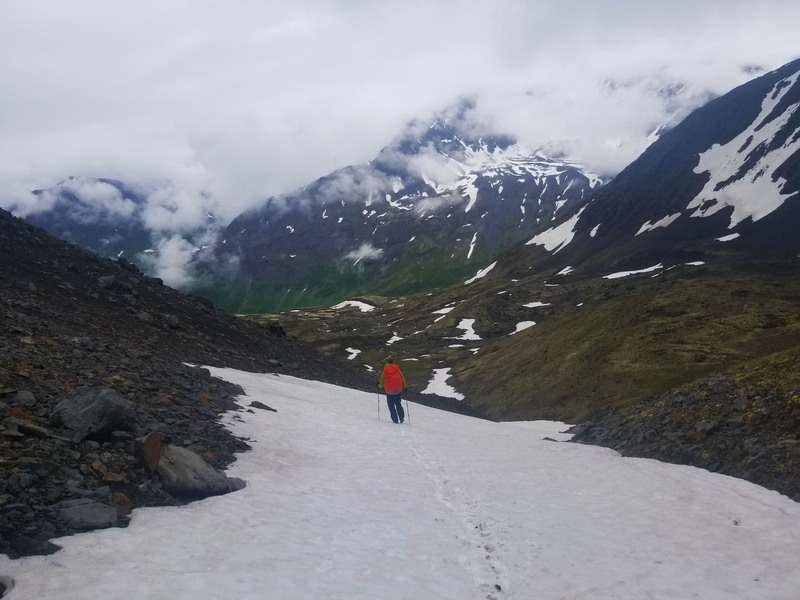 As we descended the path headed towards the truck, I thought about how I wasn’t ready for the trip to end, and how special Alaska really is. 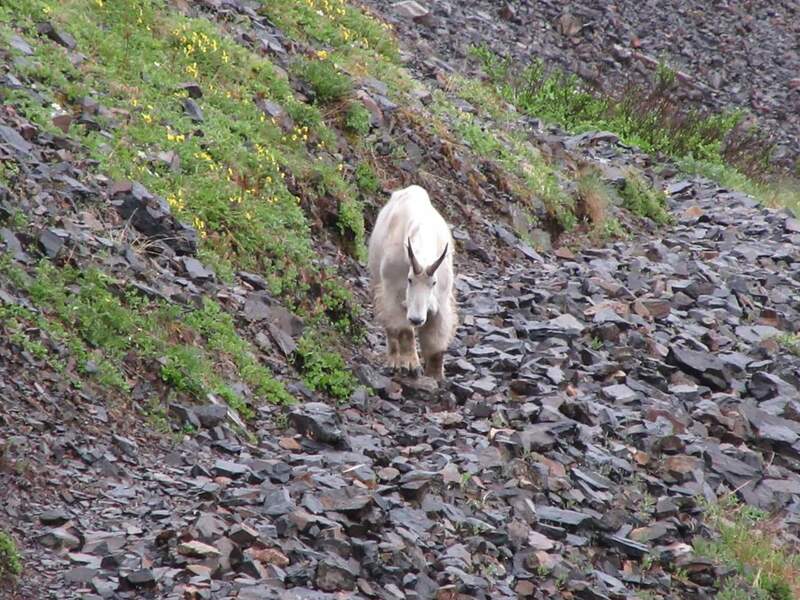 Then all the sudden a white mountain goat appeared on the trail headed directly for us! The huge beast just walked towards us without a care in the word. We went high standing on a slope just 15 feet above him. He trotted by grazing on grass and flowers as he went, not caring that we were standing just feet away. Look at this huge fella! Excited we snapped pictures and watched him closely pass. Awesome!!!!! 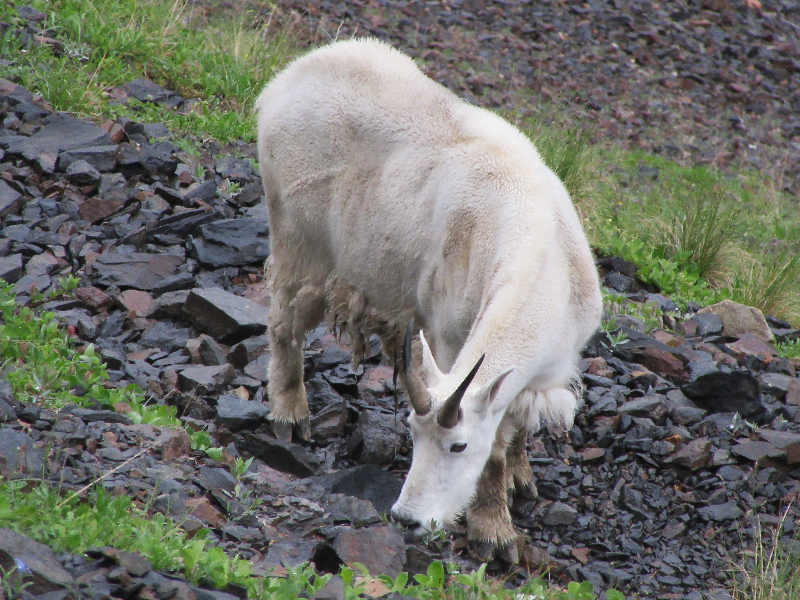 I had been hoping for this the whole trip, and just feet away I finally got a close encounter with a mountain goat in Alaska. 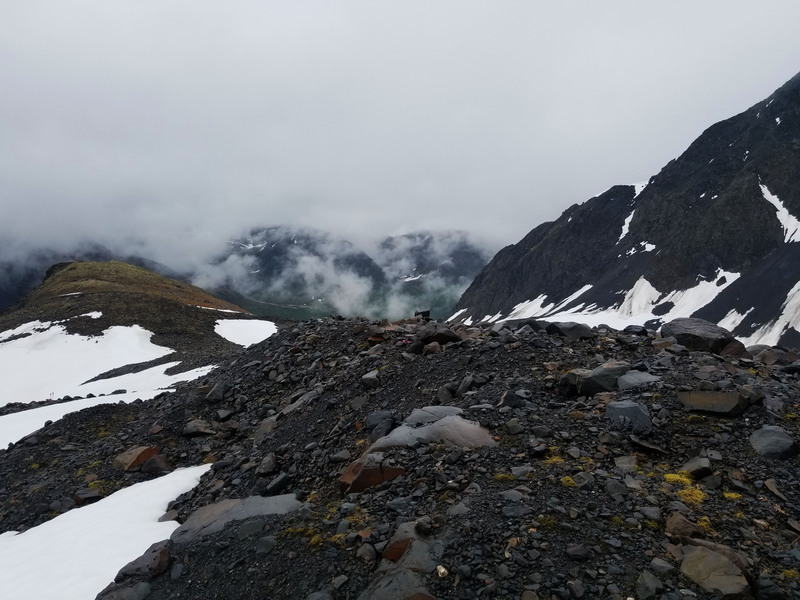 We trekked the final miles to the truck high on the experience and were soon throwing out packs in and pulling off our wet clothes for dry ones. 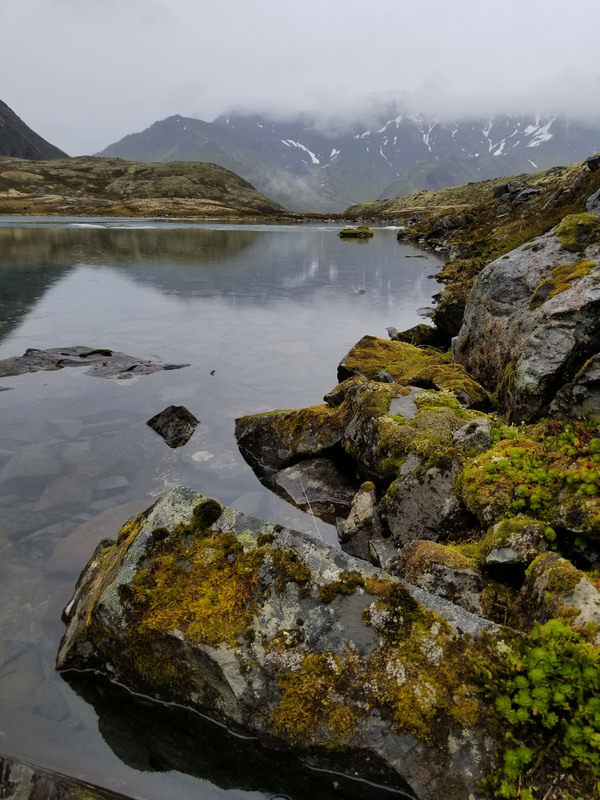 Alaska is a beautiful raw place, and I was so happy to see it. Time to dump down the choss and snow! Food: 1 Bagel, 2 Protien bars, 2 Cliff Protien Bars, 2 granola bar, 1/2 bag of gummyworms, Apple, 1 Mountain House: Chicken and Mashed Potatoes, 1/2 bag of Salt and Vinegar Chips, 1/2 bag of trailmix, 1 PB&J sandwich, Maruchan Chicken Ramen, Snickers.